This weekend was Ben’s cousin Alex’s birthday and his girlfriend decided to throw him a Batman-themed surprise party. I volunteered to make a few special cakes to take along. 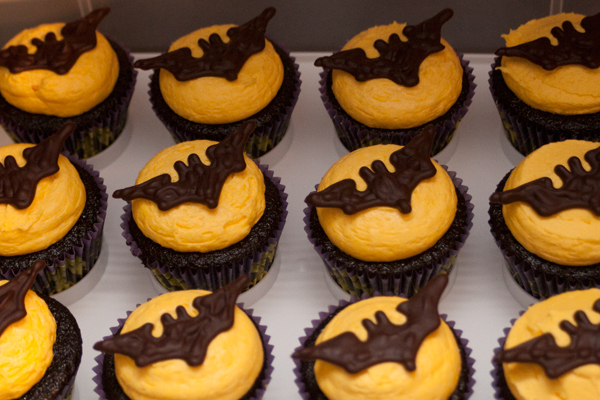 I decided to evoke the theme by making the bat signal, and I used some cupcake liners with bats on them as well. 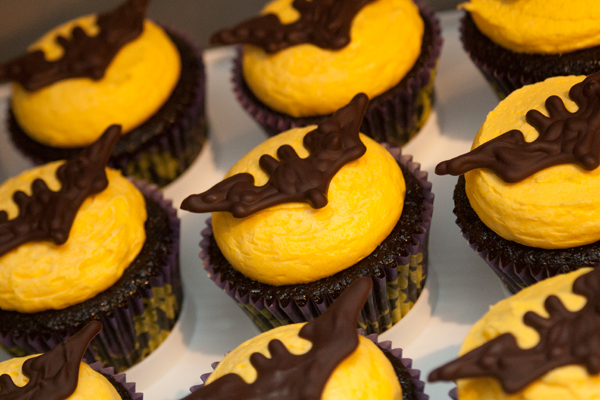 To make these, I made Guinness chocolate cupcakes for the cakes, and then a basic vanilla buttercream (using butter, vanilla, and icing sugar) and dyed it bright yellow. The frosting was piped on using a jumbo cupcake icing round tip: hold the piping bag straight at 90-degrees about 1/2 an inch away from the top of the center of the cake and hold it there while you pipe the icing on. It will fill out towards the edges on its own. When you’ve covered the desired amount of the top, reduce the pressure on your piping bag, dip it down a bit, then lift. To make the bats, first draw out the bat shape multiple times onto a sheet of paper, then place this on a baking sheet and lay a sheet of baking paper over it. Tape down the edges of the baking paper so that it doesn’t shift when you are trying to trace the shapes. Melt some chocolate (I used semisweet, as I had some on hand from a recent trip back to the States, but otherwise use dark chocolate) until it reaches a thick, but still liquid-like consistency that you can pipe with. Fill a piping bag fitted with a small circular decorating tip (like you’d use for writing) with the melted chocolate. 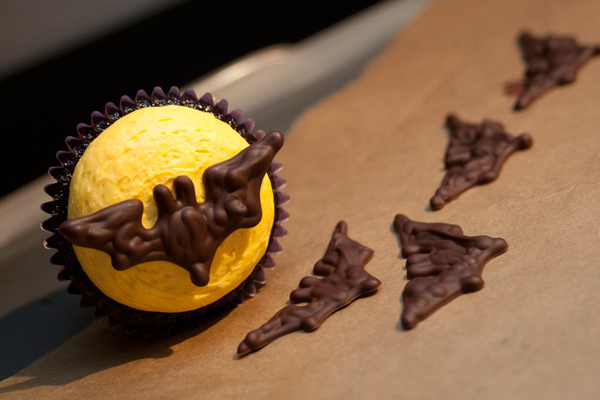 Quickly trace over your bat shapes with the chocolate, starting by outlining the shape then filling in. Once you’ve traced all of your bats, leave the chocolate to set. If you need it done faster, you can put them in the fridge, but you won’t get the same shine. I put these in the fridge because I actually wanted the chocolate to be a bit dull – it just seemed to fit with the matte black finish on The Dark Knight’s costume and cars. I really loved the way these cakes turned out, especially since I did them on a bit of a whim. I was able to get a really great effect without a whole lot of extra effort – so I will definitely be using chocolate to decorate again!